Having trouble germinating your plant seeds? Have you noticed that certain plants appear from the soil already weak and especially vulnerable to pests and disease? Cold soil may be the culprit. Many plants need the temperature of the soil to be above 65° F in order for the seed to germinate. If you're trying to plant corn, peas, or other finicky temperature-dependent crops, you need a soil thermometer. Our sleek metal design easily inserts into the soil to give you the most accurate reading possible, letting you know when it's the right time to plant certain seeds. Don't just rely on the calendar. 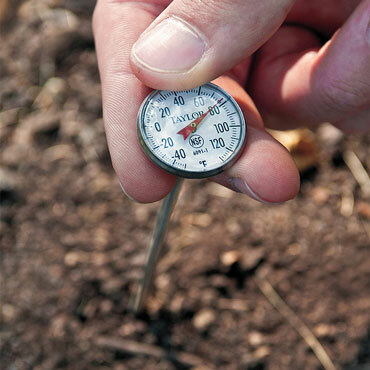 Rely on the readings from your soil thermometer!